President Thomas E. Stinnett called the regular meeting of the Riegelsville Borough Council to order at 7:01p.m. December 12, 2018. Following the Pledge of Allegiance, roll call was taken. PRESENT: Thomas Stinnett, Ed Bartosiewicz, Ann P. Moyer, Rodney Scott and Mayor Stokes. Absent Kate Brandes. Bartosiewicz motioned to approve the minutes from November 14, 2018. A. Moyer Seconded. Unanimous. Letter dated November 1, 2018 Thank you note from Riegelsville Public Library, for the Halloween Parade volunteer Judges Kate Brandes & Ann Moyer. Ann P Moyer called the meeting to order at 7:07 pm on November 21, 2018 at the Riegelsville Borough Hall. Members Present: Ann P Moyer, Rodney Scott and Tom Stinnett. Others Present: Jim Kopchak-Borough Zoning Officer, Todd Myers-Borough Engineer, Frank Preedy-EMS Coordinator and Sherry Masteller-Borough Secretary. Concerns from citizens: No one present. 2 Building permits: New Electrical Ground and Deck and 275 Gallon Oil Tank replacement. 2015 ICC Code books are ordered. Library News: Borough office received the October 2018 Directors report, the minutes have been filed in the Borough office. They did not have a quorum for the October Board meeting. The grant to the Upper Bucks Community Foundation for our new Art for Kids in the Summer Program has been sent in. We have added a “Donate” button to the library Facebook page which links to the “Support” page of library website. The Fall Used Book Sale is scheduled for Friday November 16, 7-9pm, Saturday November 17 and 24th 9am-4pm. The Cookie and Posh Presents sale is schedule for Sunday December 16, 9am-3pm. Proposed Walking Trail: Still in the process of clearing the PNDI (Pennsylvania Natural Diversity Inventory) relating to Bog Turtles. October Breakfast served 260. Next breakfast is December 16, with Santa- then after breakfast Santa drives around on the Fire Truck. December 1, is the FREE Community Dinner. Chief Myers stated that our Station 42 lost a life member John Rizzo and now Ed Bartosiewicz is the oldest fireman. 2019 Calendars continue to be sold. UBREMS News: Nothing new to report. 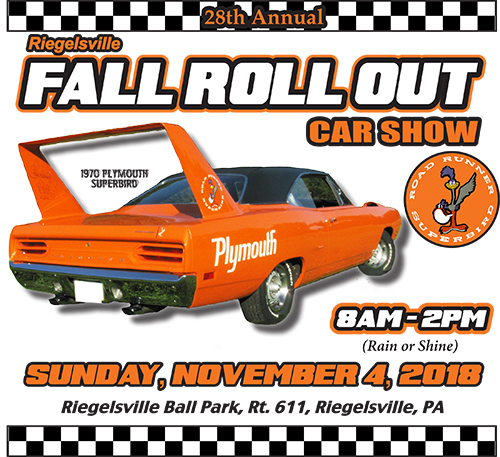 We had a great weather day for Fall Roll out car show on Sunday November 4, there is a few invoices to get paid and donations are being sent out. Riegelsville Emergency Management: Frank Preedy reported to Council that he scheduled the year end meeting on Saturday December 1, 11:45-12:30. If we would open a warming station, Frank would need to let BC EMA know, Palisades is our closest warming station. There is also an App to be used instead of the windshield notices. Riegelsville Planning Commission: No Quorum for November. Misc: Council discussed the email that Tammy Macaluso, Tax collector sent Council in reference to her altercation with Mr. William Nelson on today November 21. A few things are being discussed and will be discussed during December Council. Rodney Scott called the Utilities meeting to order at 7:46pm on November 21, 2018 at the Riegelsville Borough Hall. Members Present: Rodney Scott, Ann P Moyer and Tom Stinnett. While Matt is on vacation Sonny is available for the Water Co. Both generators were serviced and the one at the Borough office needs a new battery, ES2 will get us the quote for a new one. Todd Myer’s, Borough Engineer updated Council that the bog turtle testing results came back. The penn dot permiting has been sent in for the Trail project, Spring hill waterline and Ash lane waterline. Yearly Landlord letters were sent out November 20, they were sent early due to the January cut off for Tammy to get the per capita tax lists out to printer. Ed Bartosiewicz called the meeting to order at 7:01 pm on December 5, 2018. Comments from Citizens: One Borough resident present-No comments at this time. December 11, 2-5pm Electronic Recycling Day at Parking lot of the Riegelsville Community Fire Co.
Ed gave Council members a copy of the proposed AT&T monopole at the Fire House. Council discussed the location. DBB Electric gave an estimate for Well #2, Council suggested getting an additional estimate. Ed discussed the needed sidewalk/railing repair located at the traffic light. Kate Brandes called the meeting to order on December 5, 2018 at 7:21 pm at the Riegelsville Borough Hall. Kate Brandes, Ed Bartosiewicz, Tom Stinnett and Rodney Scott. Comment from Citizens: No Comments at this time. The Borough 2004 Ford Truck that was sold at Municibid auction was paid and picked up on Friday November 30, $5100.00 certified check was deposited too. Sherry distributed the November 2018- “Planning InSight” Bucks County Planning Commission. Sherry discussed with Council to purchase some kind of a phone for the Water Co. instead of giving our personal cell phones. T. Stinnett suggested to check with RCN to see if they offer anything. Approval to advertise the Draft 2019 Budget. E. Bartosiewicz motioned to approve. A. Moyer seconded. Unanimous. Approval to advertise Ordinance #240 AN ORDINANCE OF RIEGELSVILLE BOROUGH, BUCKS COUNTY, PENNSYLVANIA ENACTING AND LEVYING CERTAIN TAX RATE ON ALL REAL PROPERTY WITHIN THE BOROUGH. E. Bartosiewicz motioned to approve. A. Moyer seconded. Unanimous. APPROVAL OF BILLS: E. Bartosiewicz motioned to approve bills. A. Moyer seconded. Unanimous. Next regular Council Meeting January 9, 2019 7:00pm. This entry was posted in 2018 Minutes. Bookmark the permalink.